Yet 40 years after 12 men allegedly set foot on the moon, not a single other person has done the same, nor attempted to do so. Does this not seem a bit strange? Yes, very strange given our technological advances since the last Apollo flight. One would think that an outpost on the moon and further manned missions would have been justified if we are to go to Mars? Misha wrote: Yes, very strange given our technological advances since the last Apollo flight. One would think that an outpost on the moon and further manned missions would have been justified if we are to go to Mars? Why? What are the economics of an outpost on the moon? What are the pros vs. cons? One thing's for sure, they could certainly produce better fake photos these days. Just to clarify, although I am not a photo expert, I do not believe the moon photos are faked. My argument is that it doesn't matter if they are or aren't when attempting to prove we did not land on the moon. Also in reply to Scepcop questioning why we haven't gone back, that's a red herring as again, that doesn't have anything to do as to whether we went there before. Well, in fairness, PW, while you are technically correct, if the photos were faked that would be a serious red-flag that would demand much closer attention to the other claims made about the moon landing. As for not going back: that report that Scepcop cited (and incorrectly interpreted) looking at the radiation issue says that it was drafted specifically in the context of preparations for going back to the moon. lol, OK. Pseudosceps generally don't seem very open to convincing evidence, so that doesn't surprise me. Seems to be a combination of laziness and stubbornness, two very appealing attributes. Well, I am a photography expert and I can assure you that at least some of those shots have been lit with additional light sources. I use studio lights and speedlights every day so I'm familiar with their effects. I am also familiar with the dynamic range of a camera and even the best cameras today would not have been able to reproduce the dynamic range some of those shots exhibit. I do not, however, jump to the conclusion that that means we didn't go. I think it is quite likely that they produced backups for publication that look competent. I would imagine they got the original negs back and they would have been awful. That's interesting coming from a photo expert and much appreciated candor from you, 23rdman. Consider this. NASA would go a long, long way in proving we went to the moon by at least showing the bad pictures, for lack of better words. NASA could illustrate how some photos were off-centered, over or under exposed, or even film that might have been damaged by radiation. 23rdman, I am very interested in your take on whether celluloid is susceptible to Alpha, Beta and Gamma radiation going through the Van Allen belts along with Galactic Cosmic radiation outside the belts and on the moon. If we look at the photos and determine they have been altered than would this not be analogous to a detective finding his crime scene has been tainted? Would this not bring into question motive? Would this not taint the whole crime scene? Would not Apollo fall under the same scrutiny? What also interests me is that as far as I know Eastman Kodak never capitalized for propaganda purposes that it was their film which was used during the Apollo missions!? Needless to say, I would think any company would have exploited the Apollo feats by illustrating it was their film which was used in the missions. If you guys find any advert to say otherwise I would be interested. But the safer inflight videos are faked too, and suggest no mission ever left low earth orbit. The23rdman wrote: Well, I am a photography expert and I can assure you that at least some of those shots have been lit with additional light sources. I use studio lights and speedlights every day so I'm familiar with their effects. I am also familiar with the dynamic range of a camera and even the best cameras today would not have been able to reproduce the dynamic range some of those shots exhibit. Right - there are some questions that need delving into a bit before we reach any conclusions. So 23: why don't you pick something from this thread that you feel is particularly intriguing, and start a thread on it so that we can look into it in more detail? You are right there are multiple lighting sources. What artificial lighting sources are you implying were used ? The23rdman wrote: I do not, however, jump to the conclusion that that means we didn't go. I think it is quite likely that they produced backups for publication that look competent. I would imagine they got the original negs back and they would have been awful. There's absolutely no reason the supposedly staged photos would need to be lighted with multiple sources any more than the genuine photos. Do you know why ? The no star argument doesn't hold water. 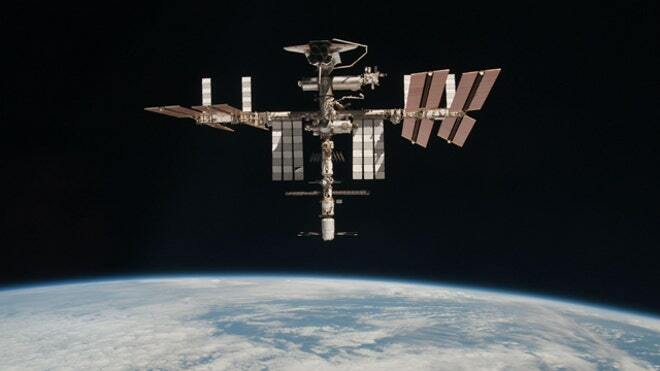 Here are some photos of the International Space Station and space shuttle in orbit, notice no stars. I've included this time some videos of astronauts working outside of the space shuttle. Please note no stars show. Also note there are multiple lighting sources. In the 1st video at about 9 minutes listen to what the announcer says about seeing stars with the naked eye. So Syd: you gonna start a thread with the picture you want to discuss in more detail or what?